All teas (Black, Green, White, Oolong) come from the same plant (Camellia Sinensis). Camellia Sinensis grows into a tree in its wild habitat, however for easier cultivation the plants are typically pruned to bushes. Tea plants are relatively hardy and can handle light freezes fairly well making them good candidates for outside plants. However cultivating this outdoors may be a challenge in many areas due its need for very well draining and highly acidic soil. Camellias are very common plants in nurseries. One of the more available Camellias is the Camellia Japonica, an absolutely beautiful shrub, very similar in appearance to the Sinensis. The main difference is the flowers. Japonicas have very extravagant flowers of varying colors, while the flowers of a Tea plant are smaller and white. Camellia Sinensis is an very rare find in North American nurseries but is readily available on the Internet. Growing a Camellia from seed is relatively difficult and can take many months for germination so I would recommend buying a live plant. Taking care of a tea plant is easy and rewarding. As an owner you must make sure to keep the soil constantly moist, but be sure not to water too much too often. Although the soil should be well draining the moisture will be retained for days (if indoors). If you are having difficulty with moisture retention you should try adding some vermiculite to your soil mix. Equally important is a soil Ph between 4.5 and 6.5. Controlling acidity is easy, and a Ph meter can make it even easier. To acidify soil you should add soil sulfur or even pine needles to the top soil. 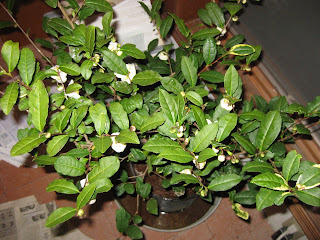 This is one of my young tea plants that is a variety called "Sochi Tea". It originates from a Russian tea plantation and is drastically different than my other tea varieties. It varies in its larger more rigid leaves. The texture of the leaves is also quite different, they are more leathery and soft compared to typical tea leaves which are somewhat waxy. As my oldest tea plant this will soon produce a lot of tea when spring rolls around. It is over three years old and is a variety with a yellow variegation on some of the leaves. Are the petals of a Camellia Japonica safe to consume raw?